If I’m wearing an outfit some would consider “fashionable,” there’s about a 90% chance that StitchFix picked it out to me. The other 10% comes from the fact that I really, really like Nordstrom Rack. It’s hard to believe that I started doing StitchFix boxes almost a year ago, and they’ve just continued to get better and better. I feel like Margaret, my stylist, is kind of like my BFF. So, needless to say, some major swooning happened with the last box they sent me. 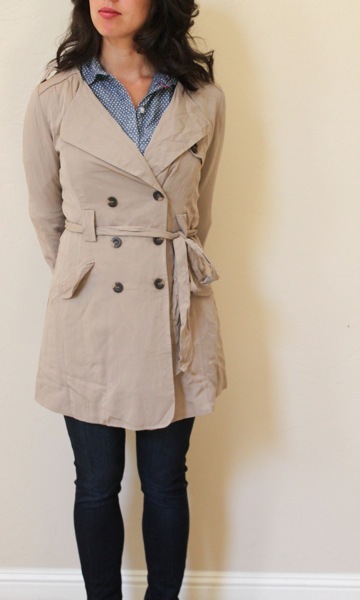 A trench is something I’ve always wanted, but could never justify since it doesn’t get that cold here. Winter clothing never seems to be worth the investment. This trench is perfect because it’s light; I can tell I’ll wear it a lot this fall and spring. Amazing sidekick making the best face ever: priceless. Black skinnies with leather trim. These were way too small for me (they’re an XS and I couldn’t get them over my calves) but I kept them because if you get the entire box, you save 25%. So, they were free 🙂 If anyone is an XXS that wants them, first dibs, send me an email and pay for shipping and they’re yours! You can never have enough of these, and I adore the fun print! 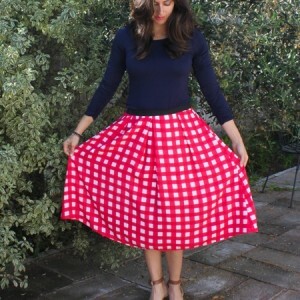 This is another one that can easily be dressed up or down, and layered for a mild fall. It’s light and super comfy. What’s your most-loved piece of clothing right now or fall staple? I can’t wait to wear my favorite black skinnies again. I would love the black skinnies! I am usually a size 0 (25 w), so if they’re smaller than that, I will pass! they should probably fit you. i’m usually a size 2 and they’re just not going to go on my body haha. email me: fitnessista at gmail and they’re yours! Love all of them, but the b/w dress and the last floral one look fabulous on you! Great picks from the stylist! In a recent Fix I got, there were a pair of embroidered Kensie skinnies that I fell IN LOVE with (like, found-the-perfect-wedding-dress kind of love). But they were a smiiidge too small (I got junk in da trunk), and I really needed them to fit just right…or I was gunna have to cry myself to sleep knowing I’d have to place them solemnly back in the return envelope. I emailed customer service and asked (ok, begged) if they happened to have a 28 in stock, because I loved them that much to ask (beg). Just to make sure I didn’t sound tooooo crazy, I let them know that I completely understood if they didn’t (per their disclaimer). As luck would have it, they had a pair in the correct size for me, and he gladly made the exchange! Moral of the story… If you get something that doesn’t fit quite right–and you really like it–shoot ’em and email and just check if they still have any in stock! 😉 They might not, but it doesn’t hurt to ask! ohhhh good tip!! thank you! LOOOOVVVEEE your black and white heart print shirt. Is that also from Stitch Fix? Wow those are some great items!! I wish I could afford to join that site, but for now I will just live vicariously through you!! You look beautiful! I would love a post some time on how you curl your hair – it always looks PERFECT! Stitch Fix is awesome. The only time I wear something “cool and trendy” is when I’m rocking a Stitch Fix item. I love the pattern blouse they sent you. I love basics I can wear all year long. If it doesn’t work out with the other 2 posters about the skinny jeans, I would love them!! 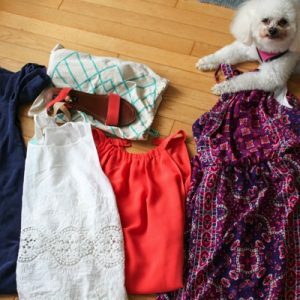 I was one of the people to win the Stitch Fix video giveaway. Needless to say, I was very excited to use my credit! I waited and waited, and never got taken off the waiting list. I was afraid it was because a am a curvy size 12/L. I was all grumpy at Stich Fix and emailed them last week to find out what’s up. I got a reply in less than an hour apologizing and they got my first fix set up for next week. I haven’t even gotten clothes from them yet, but I am a fan of the company for taking care of it so quickly! Can’t wait for my first fix- thanks for sharing the wealth! awww that’s awesome! they have incredible customer service. Love Stitch fix! The customer service is awesome and I am like you…most of my clothes are currently coming from ‘the box’ as my husband calls it! Love the floral dress! Love Stitch Fix, this last box they sent me I kept everything. Did Solibeat this morning,absolutely loved it. Lots of fun. 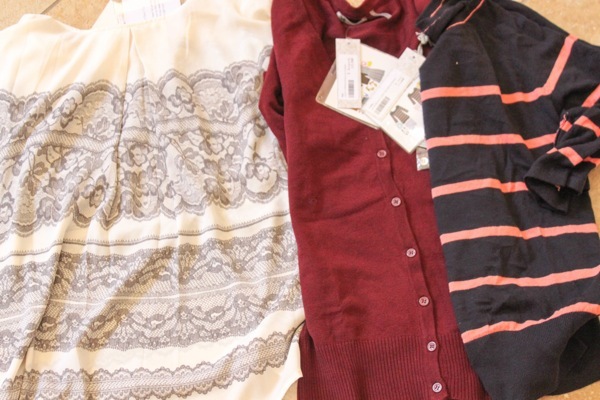 I LOVE Stitch Fix! I especially adore that heart print top….so cute! My most-loved piece has to be 2 of my scarves….one fringed and one floral print. I pair them with literally every outfit once fall/winter hits here in Tucson….I can’t wait to for it to cool down so I can start wearing them again, along with my riding boots! You are the cutest! Love all the pieces! 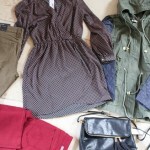 I think I need StitchFix in my life, however, I am a little hesitant due to the cost of it. How does the cost work and how much would you say on average someone pays for it all per month (fees, cost of clothes, etc.)? I’ve done StitchFix twice, you can choose a price range you prefer. I pick sort of the low- to medium-end price range and my stitch ends up coming out to around $250-$300/box or so, and that’s with the 20% keep-it-all discount and having the $25 styling credit returned (or was it 25% and $20?). So it comes out to about what you’d pay at a department store if you’re not trying to score some sales. Also, you can put in a request for what kind of pieces you want. Last time, I asked for only tops and no dresses/jewelry, and it came out a little cheaper since tops are less expensive. Obsessed with the striped sweater/top on the right of the tops pic, who makes it? My current most loved piece of clothing is an oversized navy and off white striped sweater from gap, perfect for days when I don’t want to have to think about what I’m wearing. Just out of curiosity, if you were to have paid for the box how much do you think it would have cost? There’s a lot in there! You have had much better luck than me! I keep giving it another chance, and they are always off with size, style, or pricing. Do you get 10 items since you’re a blogger who writes about them? The usual is 5, and I haven’t seen an option to get more. Looks like a great haul! 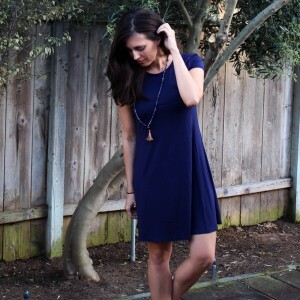 Love the date night dress — it looks great on you! Thank you thank you!!! Love it!! Can’t wait for my box! Is stitch fix worth the investment? Well, you are earning those referal credits, because after seeing Stichfix pop up on a few blogs now, this was the post that convinced me to try it! I love almost every item! Can’t wait for my box to arrive! I can never get skinny jeans over my calves either, btw! I’d love it if you shared the price of the box or individual items. It’d help me decide if this is something I should sign up for. 🙂 I adore that black and white dress on you, BTW. They did good with that one! SERIOUSLY! That dress 🙂 By any chance, do you know the brand on that one? I love that belted turquoise dress! All so cute! I’m going to try it out! Have you ever had a box where you didn’t buy anything? Do you look your $20 deposit then? Thank you! Very good to know! That pink martini dress is super cute. I just bought an awesome Pink Martini blazer and want to check out more! Some cute outfits! I do especially love the trench coat and your date night dress. I haven’t had the best experience with StitchFix, sadly. It’s because I’m a bit larger, a size 16. 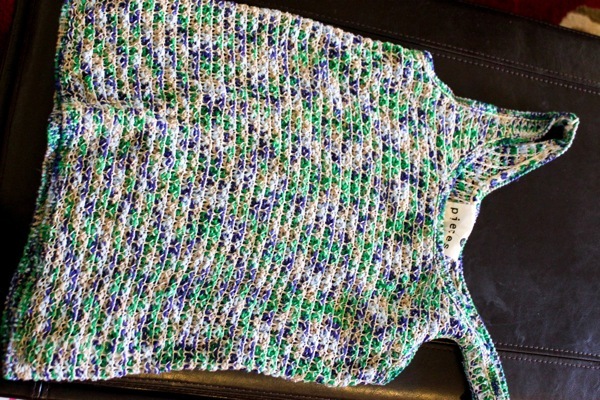 They send me crazy cute stuff, but it hardly ever fits right (cropped tops for girls with a belly? erm, no). I almost always keep the jewelry they send me which is gorgeous, and have kept a few tops and a wrap dress that I really do love, but if you’re a bit on the larger side, they don’t quite have us figured out yet. They emailed me last month saying they would have to skip my fix for the month because they just didn’t have anything for me. Sad panda. This month’s is in the mail to me now, so we’ll see, but I this may be the last one I get from them. Hopefully they get us curvier girls figured out! I could really use a bit of style! 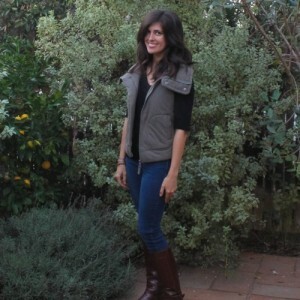 Hi Gina- I always love the items you get from Stitchfix; more than the items they send me. I was wondering if you wouldn’t mind sharing what you wrote on their form as your style preferences. I keep changing my options to get things I’ll like more but I have yet to like anything as much as I like your pieces. Thanks! I feel the same way! About to cancel mine. BOTH of those dresses are to die for. Love, love, love!! I’ve also been trying to justify getting a fall trench coat since it is such a short season here in Ottawa, Canada…but I love the look of the beige one on you!! most loved piece of clothing right now?….a blue trina turk dress with a geometric print that i waited SO patiently for to go on sale and got on the cheap from hautelook. i actually wore it to work today. trina turk is my go-to clothier because many of her pieces are made in the USA. some of them aren’t so you just have to check labels. my husband and i have been focusing on buying more US made products in the last year and a half. i don’t think i really have a fall-staple so to speak. i love jackets and have 3 different trenches that i bought 3-4 even 9 years back that i wear every season. can i just say that your hair looks gorg’ in every photo! I love the trench & the flower dress! 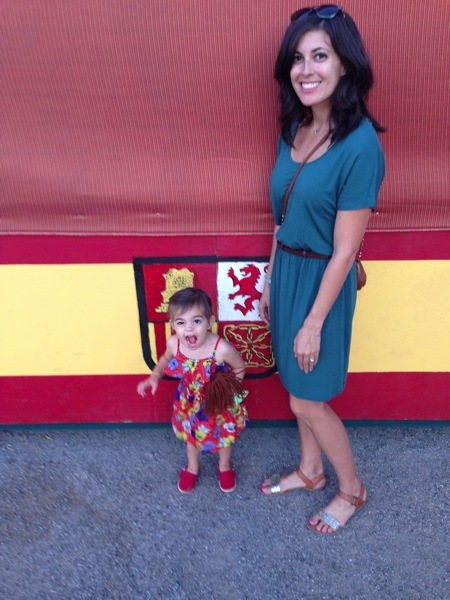 I have been hearing about stitchfix, but am still iffy only because of how much it is. Hoping after Christmas time to be able to get one! Love the post & everything looks great on you! That floral dress is my favorite – so pretty! PS: hope I look like that when I’m a mom! Jeez!